It is possible Sir Arthur Conan Doyle knew the characters of Sherlock Holmes and Dr. John H. Watson would outlive him by decades. But what I doubt he could have fully imagined was the numerous ways in which the great detective would be portrayed on the screen -- both big and small -- and, in recent years, outside of the traditional constraints of English society in the 1800s. 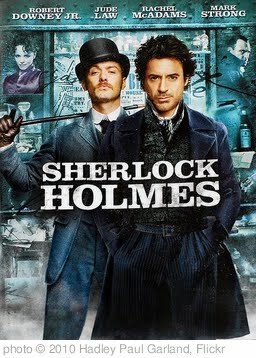 Case in point: 2009's Sherlock Holmes, directed by Guy Ritchie and starring Robert Downey, Jr. in the iconic role. Simply put, this isn't your grandmother's Holmes, puffing away on his pipe beside a crackling fire while amazing Watson with his deductions. There is nary a deerstalker hat to be found, and one gets the impression it could be dangerous to even light a fire in the iconic rooms of 221B Baker Street. This Holmes is brilliant, yes, with a mind that is always whirring. His deductions still follow paths that can confound the average mind, and Holmes still chides those around him for 'not keeping up'. But he is more than a brainiac here. Downey's Holmes is a bit of a slob, a very adept fighter, and at least a teensy bit of a romantic if his scenes with Rachel McAdams' Irene Adler are anything to go by. And while there are movie critics who did not like the bombast or the energy added to Doyle's creation, I, for one, enjoyed it. There was an energy and a sense of fun in Ritchie's vision of the world of Holmes and Watson, and a genuine friendship and affection between the two men. Watson wasn't simply a sounding board for Holmes, but a friend and an ally on whom he could depend. There is more of a grounded feeling to Holmes in this film, and less bumbling to Watson.